Anne holds up her beautiful “Rêves de Soie” design in lotus pink. I got to meet the wonderful Anne Touraine at Accessories the Show in September, the gigantic trade show at the Javits Center in Manhattan where designers show their collections to fashion buyers and editors. It was an amazing experience, like going to the bazaar, with stall after stall of lovely things. I have been a big fan of Anne’s blog Playing with Scarves from the moment I discovered it and was so impressed when she took her passion for silk scarves a step further by creating her own line of them, ANNE TOURAINE Paris. Anne works with a small team to create the lovely designs, which range from classic to modern. Anne showed her collection at Accessories the Show in Manhattan. I love the styling of the scarf shown here! Photo by ANNE TOURAINE Paris. 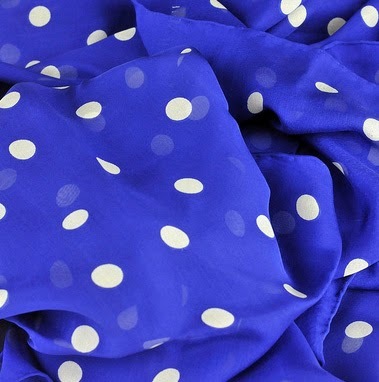 One style that particularly caught my eye was the oblong scarf of silk chiffon in polka dot. I like polka dot anyway, which I consider a pattern that’s always in style, but what I particularly loved about this scarf was the shape and size. I love an oblong scarf more than any other shape and this generous size (67x26”) is incredibly practical—you can wrap it around your neck a few times, drape it over your shoulders like a shawl, even tie it to your bag, as the model shows above. And that is just the beginning of ways to wear it! Love this blue! Photo by ANNE TOURAINE Paris. The silk chiffon feels like heaven, the hem is hand-finished, and the deep blue is utterly gorgeous. I have been wearing this scarf to give my outfit a pop of color and my spirits a lift on gray days. It was the scarf I wore to the Manhattan Vintage Show and had a chance meeting with Jean Paul Gaultier so I have now designated it my Lucky Scarf. I am convinced the color caught his eye! Wearing my Lucky Scarf at the Manhattan Vintage Show in October 2013. Photo by Denton Taylor. The silk chiffon scarves also come in these fabulous colors! As for Anne, she is so genuine and warm and charming and funny. I liked her instantly and I’m telling you, you would too! Did I mention she is also generous? She gave the scarf to me as a gift, which was so sweet of her. Thank you, Anne! You can check out the entire of line of ANNE TOURAINE Paris silk scarves and scarf rings at her website www.annetouraine.com. Any of Anne’s scarves would make a great Christmas present, for yourself or a special lady in your life! Each comes in a lovely box tied with a signature ribbon and includes a complimentary guide of 20 different ways to wear a scarf. And Anne is an expert on the topic, before she started her line she was giving lectures (with tutorials!) to women’s clubs on this very subject. Right now Anne is offering a special private sale that I’m excited to tell you about. You can take 20% off orders over $100 at her website www.annetouraine.com. The offer is good until December 31, 2013 and you can use the code SILKYTREAT4U at checkout as many times as you like! Disclosure: The scarf was a gift from Anne which I decided to review for this post (though she did not ask me to!). All opinions are my own. Loved this post Jill! What a beautiful color on you. I will most definitely check out her Anne's website. Scarfs are a great way to accessorize an outfit . I love how they can be worn in so many different ways. Your polka dot scarf looks great on you. Glad to know you’re enjoying it.